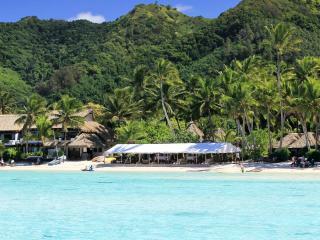 Pacific Resort Aitutaki is, as its name suggests, located on the Cook Islands main island of Aitutaki. Nestled in 17 acres of lush tropical forest and resting on the white sandy beachfront of Aitutaki Lagoon, the resort faces west providing fantastic views of the famous sunsets. The half mile of soft white sand beach runs parallel to the resort and provides a stunning backdrop to the all tide swimming lagoon. Pacific Resort Aitutaki features 29 luxurious boutique bungalows and villas uniquely styled in traditional Polynesian elegance. 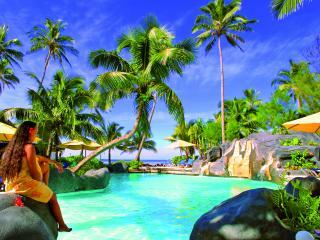 This resort has only one aim to make your Cook Islands holiday a memorable, relaxing and extravagant experience. The friendly staff provide excellent service and deliver on this promise in many ways, from the lavish rooms all the way down to personal touches like Bvlgari luxury bathroom products. It's attention to detail like this that make Pacific Resort Aitutaki the accommodation of choice with so many visitors to the Cook Islands. The spoiling doesn't stop there either, as the resort is happy to provide complimentary snorkelling equipment and sea kayaks to make your exploration and passage around the island as easy and enjoyable as possible. Their handy local knowledge is also a huge bonus as they are happy to assist with recommending and booking lagoon cruises and local tours. Pacific Resort Aitutaki is just 40 minutes flying time from Rarotonga but is well worth the short flight for a luxurious, friendly and personalised stay on your Cook Islands holiday. Pacific Resort Aitutaki features a total of 27 bungalows and villas, all beautifully appointed and accompanied by personal touches that turn your Cook Islands holiday into something truly memorable. Premium Beachfront Bungalow: Standalone bungalow with absolute beachfront access nestled amongst lush tropical gardens with views across the lagoon. Size is 62m². Bedding is 1 King Bed. Maximum room capacity is 2 Adults. Premium Beachfront Bungalow Plus: Standalone bungalow set within the tropical gardens with amazing views across Aitutaki Lagoon. Bedding is 1 King Bed. Maximum room capacity is 3 Adults. Ultimate Beachfront Bungalow: Offers a private deck, beachside shower, indoor and outdoor day beds, indoor garden view shower and private garden with open air shower. Bedding 1 King Bed. Maximum room capacity is 2 Adults. Ultimate Beachfront Villa: Split level spacious villa perched on spectacular black volcanic rock. Villas have separate bedroom and sitting room, beach and private garden showers, large private outdoor sundecks. Panoramic views of the lagoon with a private staircase down to the beach. Size is 125m². Bedding is 1 King Bed. Maximum room capacity is 2 Adults. The Rapae Bay Restaurant: This signature restaurant is home to a tantalising array of unique and fresh Pacific Island cuisine. Enjoy stunning views across the lush landscaped pool, brilliant beach and glittering lagoon accompanied by a tasty meal and an ice cold cocktail or nice glass of wine. You can't visit this restaurant without sampling their house speciality of fresh grilled local seafood and tender organic meats slow cooked to perfection. Friday night is Island Night and an essential part of your stay at Pacific Resort Aitutaki. Fill up on an indulgent full seafood buffet and party on with entertainment, traditional dancing, drumming and singing. This is one event not to be missed. Black Rock Cafe: A great alternative to the restaurant, this beachfront bar and cafe offers food and full bar service in a more relaxed, informal setting. All food offered is of a high quality and much of the menu comes from the restaurant so if you feel like relaxing you don't have to miss out. Set beside the stunning beachfront pool and waterfall complex this is a great place to put your feet up and fill up on some delicious food or enjoy a tropical cocktail. Tiare Spa: A wide range of facials, body massage and scrubs are available at the Pacific Resort Aitutaki. We loved the Pacific Resort. The whole experience started from the airport greeting with the dedicated fale for Pacific Resort guests. We stayed in the beachfront bungalow with amazing views. The hotel restaurant & facilities are great, the service amazing and the staff are warm friendly and very helpful. Cannot wait to go back! 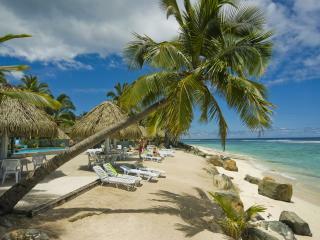 Most idyllic honeymoon location - beautiful resort and excellent service. We were treated like royalty the minute we stepped off the plane and it didn't stop until we left. The resort was exactly what I expected as I did my research, the Island was amazing, it's just like the pictures only better. It's very quiet and serene, no noisy power boats or crying children, loved it, just what we needed.